There's new excitement about reinventing the square as a key asset for 21st century cities. Since Campus Martius Park opened in Detroit in 2004, it has given a long-declining downtown a new lease on life. Families flocked to its skating rink all winter. When spring arrived, office workers emerged from their cubicles to discover the joys of lunch breaks in a lively public setting. Through the summer and into the fall, throngs of people crowded the park for outdoor movies and concerts. It's fair to say that Campus Martius Park has filled a major void in the city, becoming Detroit's town square and the cornerstone of downtown revitalization. Detroit embraced Campus Martius immediately after it debuted one year ago. 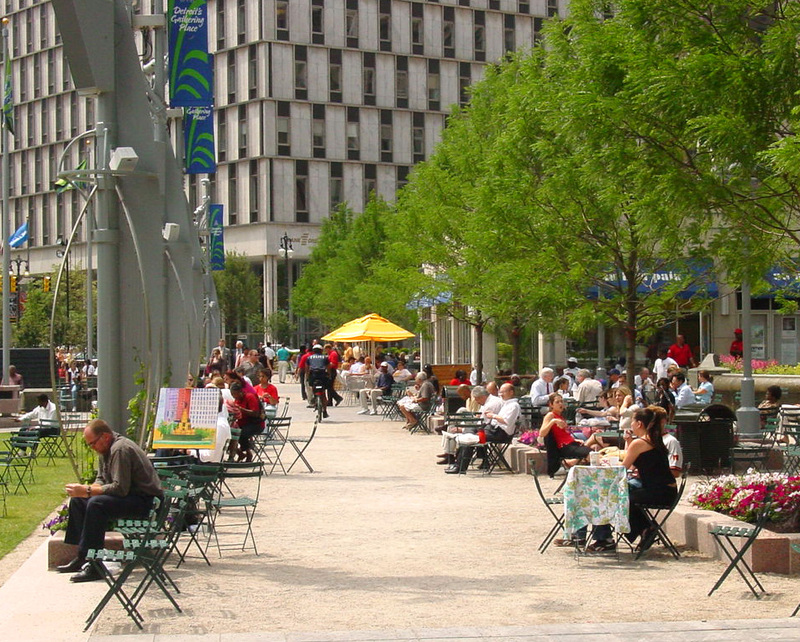 It may be called a Park, but Campus Martius is really that quintessential type of public space -- a central square. It's a place that people think of as their own outdoor living room, where they feel connected to their city and fellow citizens. In America especially, such places have become increasingly rare. Yet there is a long and rich tradition of squares in North America (Savannah alone has 22), including the courthouse squares so common in small towns throughout the South and the Midwest. Voluminous research has recently been published on the health benefits of living in a walkable environment. Neighborhoods where kids can walk to school, for instance, reduce the risk of childhood obesity and Type II diabetes. Ominously, however, studies show the area outside the home that children are free to explore unsupervised has decreased by 90% since 1970. To reverse this trend and create walkable communities, many of the routine necessities now scattered miles away from people's homes--schools, stores, libraries, civic buildings--will instead need to be focused in central places within walking distance. In other words, squares will be essential. "People today are crying out for lively gathering places." Or, take the explosive growth of public markets (profiled in our October newsletter). Markets are providing the sociable public spaces that people find lacking elsewhere. As PPS surveys have shown, what most attracts people to markets is other people. Even if the site of a market is just a parking lot, that parking lot is transformed into a bustling square during market hours. Last month, PPS received more than 360 proposals for our latest round of public market grants. They poured in from 47 states and four Canadian provinces, exceeding all expectations. When you get right down to it, this flood of applications is really a reflection of the pent-up demand for places where people can experience a sense of community. We can safely say, based on what the communities we work with tell us, that people today are crying out for these kinds of lively gathering places. Everyday citizens recognize the value of places where civic life flourishes and where different cultures can mix, places that heal social isolation--even if most public leaders are slow to understand. It is always inspiring to see grassroots communities take the lead on an important issue like creating new public gathering places. But it is also frustrating to see political leadership continue to pursue costly, often wrongheaded projects like stadiums or convention centers when much greater and more lasting social and economic gains could be achieved by investing in central public squares. Innovative cities that have seen what squares can accomplish are now reaping tremendous rewards. Look to Portland, Oregon, where Pioneer Courthouse Square has become the pulsating heart of a thriving downtown. Or consider how a quartet of squares in New York City (Rockefeller Plaza, Bryant Park, Union Square, and Washington Square) have rejuvenated and re-defined entire districts of Manhattan over recent decades. 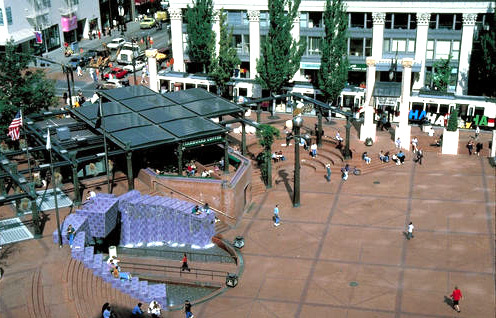 Pioneer Courthouse Square has forged a strong identity for Portland's downtown. Other cities possess similar potential but have yet to capitalize on it. Imagine, for instance, the new heights San Francisco could attain by creating a series of ten great squares along the interconnecting spines of Market Street and the Embarcadero. As in so many cities, the raw materials of a world-class network of public destinations are already in place--all that remains is to put the pieces together. For 30 years, PPS has helped cities take that next step, from our earliest work with Rockefeller Plaza to the recent success of Campus Martius. Today, as more people come to recognize the galvanizing power of squares, we are working to transform more underperforming spaces into great squares than ever before. We are contacted almost every week by communities around the world that want to create a central public gathering place. Great squares are not just for tourists to admire; they belong right in our backyards. Any community where people want to discover the rewards of public life can make a square its centerpiece.